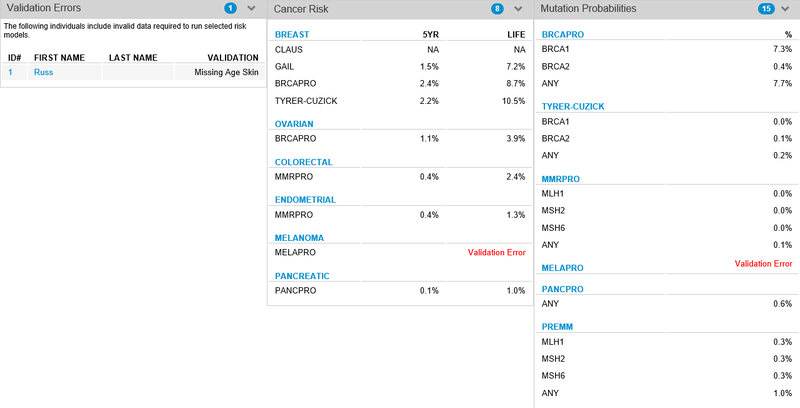 Progeny Clinical includes validated risk assessment models to calculate 5-year and lifetime cancer risk, as well as gene mutation probabilities for any member of a pedigree. Any missing or invalid data required to run these models are automatically identified for you. Risk calculation results can be easily saved and timestamped within the database or saved as a pdf file at any time. Proportional hazard model; the relative risk based on personal factors is used to adjust the calculated genetic absolute risk. Incorporates features of Gail and Claus models, as well as height/BMI, use of HRT, cousins with breast cancer, and unaffected females. Only includes biopsies with atypia, hyperplasia or LCIS. Bayesian model based on an age-specific breast or ovarian cancer probabilities. Bayesian = specify a prior probability and update in light of new relevant data. Takes into account both affected and unaffected individuals up to second-degree relatives, breast and ovarian cancer history, male brcx, bilateral brcx, breast pathology, and oophorectomy status as well as ethnicity. Does not take into account many non-hereditary risk factors or noninvasive brcx. Designed specifically to help determine risk for MLH1, MSH2, and MSH6. Takes into account First and Second-degree relatives, ages of diagnosis for either colon or endometrial, and takes into account other Lynch-associated cancers (ovary, stomach, small intestine, urinary tract, renal, brain, pancreas and sebaceous gland tumors). Developed by Mitchell Gail in 1989. A logistic regression model based on data from Breast Cancer Detection & Demonstration project (2,852 cases and 3,146 controls). Modified in 1999 (sometimes called NCI-Gail): incidence rates are for invasive cancers only; age-specific incidence rates from SEER data; included data for African Americans. Incorporates mostly nongenetic risk factors; age, race, ages at menarche and first live birth, first degree relatives with breast cancer and previous breast biopsy. Only valid for women 35yo and older. Takes into account atypical hyperplasia but not LCIS. Provides age-specific risk estimates of breast cancer in women with a family history. Based on data from the Cancer and Steroid Hormone Study (4,730 cases and 4,688 controls). Incorporates maternal and/or paternal 1st and 2nd degree relatives and adjusts risk based on age at diagnosis. Bayes Mendel includes these 4 risk models: BRCAPRO, MMRPRO, PancPRO, and MelaPRO. The Progeny software requires that the domain/IP address progenygenetics.com/192.252.146.28 be white-listed in the firewall in order for the Risk Module to be utilized in Progeny. For a more granular configuration, the domains/IP addresses listed below can be white-listed per individual risk model. Absolutely, the handshake between your web client and the risk server does not pass any PHI data from your database. All data used for calculating risk are de-identified. This data includes all the necessary fields that are required for the risk mapping such as different cancers, the age when diagnosed, genes tested such as BRCA1, BRCA2, CK14, CK 5.6, MLH1, MSH2, and others. 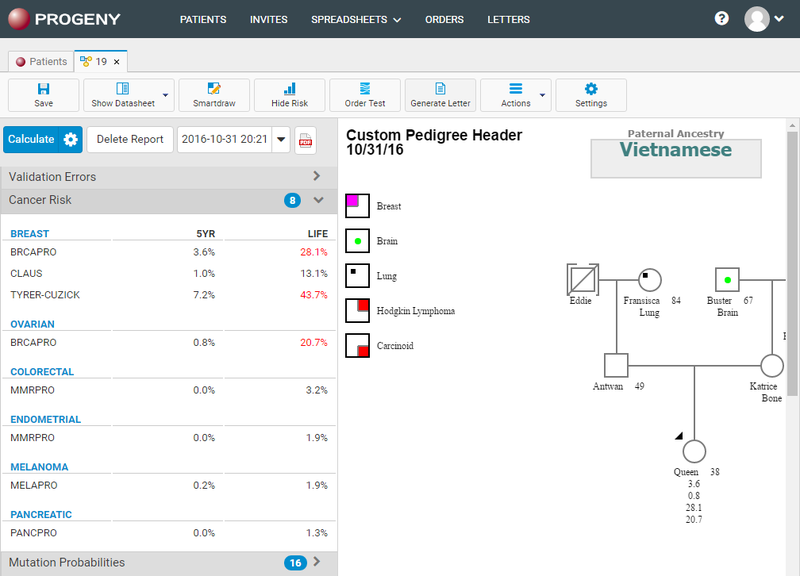 Progeny Clinical includes validated risk assessment models to calculate 5-year and lifetime cancer risk, as well as gene mutation probabilities for any member of the pedigree. 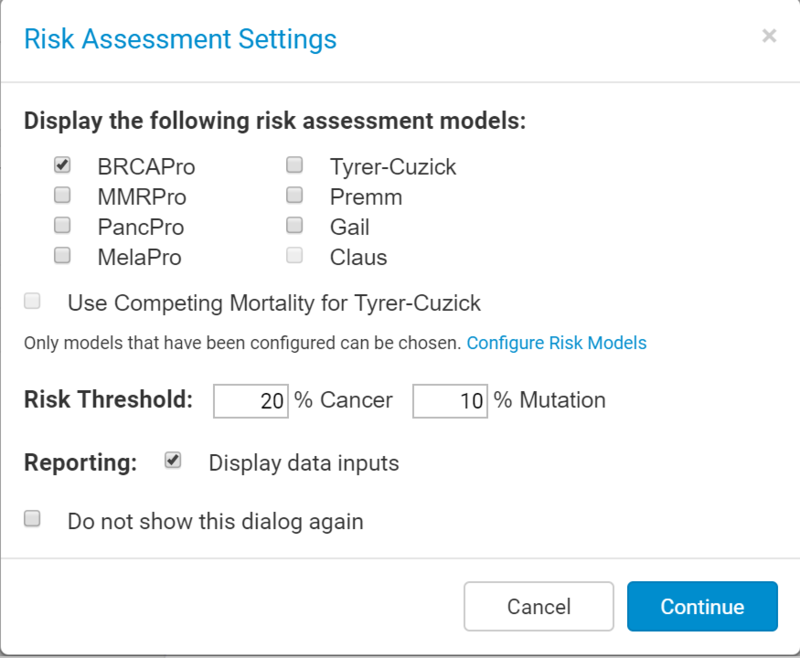 Located on the web, users now have the ability to run the Bayes Mendel, Tyrer-Cuzick, Gail, Claus, and Premm Risk Assessment Models. The Cogwheel is used to choose which risk models the user would like to run, set the risk threshold, and display data inputs. Calculate – calculates the chosen risk model(s). Save Report/Delete Report – Save/Delete the risk report which can be downloaded and/or printed as a PDF. If saved, gives a date and time stamp of when the report was saved. Risk Models – The available risk models include BRCAPro, MMRPro, PancPro, MelaPro, Tyrer-Cuzick, Premm, Gail, and Claus. Use Competing Mortality for Tyrer-Cuzick – For Tyrer-Cuzick only. Takes into consideration external factors into this Risk model, e.g. injuries, sicknesses, accidents, and other non-cancer risks. Risk Threshold – specifies what risk calculation percent will be highlighted in red once that threshold is reached. Reporting – Display data inputs – After the Risk Models are run, displays the data inputs that were taken into account when running the specified models in the PDF viewer. Do not show this dialog again – specifies that the only way to reach the risk settings is by clicking the cog wheel. Validation Errors – shows if you have missing data or if the criteria for the model to run were not met. Displayed in red on the Cancer Risk and/or Mutation Probabilities (Ex: missing age at breast cancer). Cancer Risk – 5 years and Lifetime Risk. Mutation Probabilities – All mutation probabilities are displayed here.